The question popped up on a Facebook group, and a reader promptly alerted The Legal Genealogist to this most interesting issue. The example posted wasn’t a complete certificate, but it was absolutely clear that it wasn’t a mistake by a poster. Nope, it was crystal clear: the man had died in Minnesota; the death certificate was from the State of Montana, Bureau of Vital Statistics. 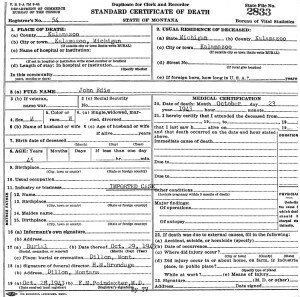 And a quick check of death certificates digitized by FamilySearch.org for the State of Montana will turn up other examples, like the one you see illustrating this post (and you can click it to enlarge the image). So… what’s up with this? Why is Montana issuing death certificates for people who died a long way away from the Big Sky State? The answer, of course, will be found in the law. And that is why you’ll find death certificates in Montana county records for deaths outside of Montana: it was legally required for a burial in Montana. Thanks Judy! You’ve done it again… made it all very clear why we need to search the laws! There’s just so much in the laws that helps us understand the records! In emailing with the South Dakota Vital Registry some time ago, I was alerted to an issue that’s probably related to the one in your post. 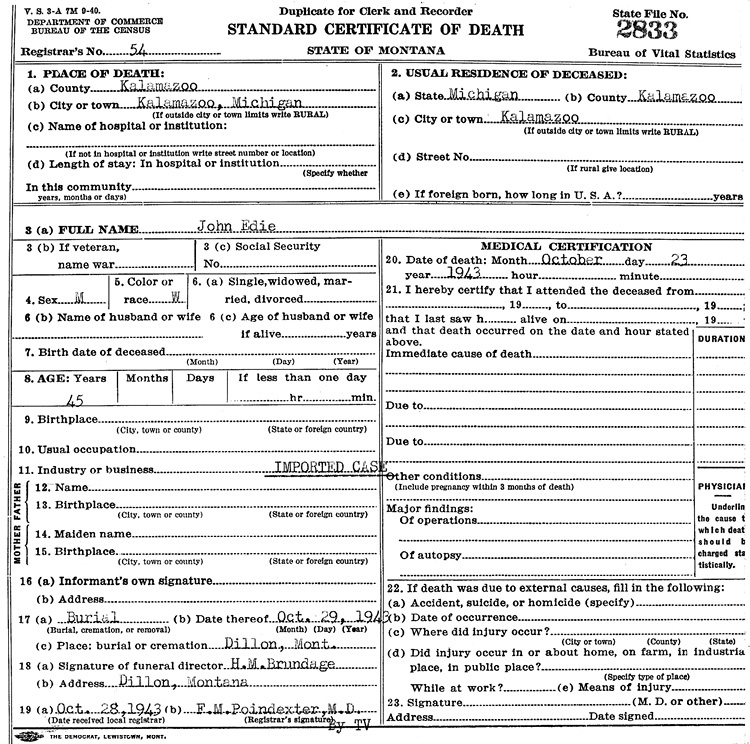 There are some deaths listed in the South Dakota death indexes available to researchers online which did not actually occur in South Dakota, and so you cannot successfully request a death certificate from their Registry. In doing research in a cemetery archive, I reviewed some body-transportation permits from around a century ago. They had all the laws about transporting a body on a train printed on the back for the train officials, and I read through them and found them fascinating. My first instinct would not have been that it was legal to transport a body that had died from an epidemic such as smallpox across state lines, and yet there the proof was in the law. Exactly the same thing here, Liz, except that these local certificates are generally NOT in the Montana state indices. And yes, there were (and are) very specific rules for transporting bodies when there was contagion and when there wasn’t. Morbid but fascinating stuff. Although not directly related to the death record issuance but an interesting aside – in at least one unnamed state I have visited which does not have open vital records, the state does require a burial permit. A friendly court house worker enlighten me to the fact that those permits were open for viewing and contain nearly identical data as the closed death records. Big help for some of us from that legal loop hole. Great bit of information, Norm — and good reason to always always ask about alternative records! Every state — and even some communities within a state — will have different rules, so you’ll need to check the laws. But look for everything, including a transportation permit from Maine to Massachusetts! One of my ancestors died in Van Wert County, Ohio, in 1883. His death is recorded in Adams County, Indiana. These counties adjoin. The death was recorded in Indiana as the physician lived in Adams County, Indiana. It’s often the case that records are recorded where convenient, rather than where the event occurred. Darn it! A few years ago, I did some indexing for John Martino of the New York City Italian Gen Society. The documents I worked with were coded for borough (= county) and they also had some miscellaneous categories. I don’t recall the specifics but one of them referred to out of state deaths of NY residents. Thanks for the post. I’ve been using the Pennsylvania Death Records to find where my family members are buried; never thought about there being a record for people who died out of state. The original question had to do with a death in Minnesota; the image I used to illustrate the post involved a death in Michigan.